Here are some questions about the words for this week. 1. Which /u/ word has the fewest letters? 2. Which two /e/ words have only three letters? 3. Which two /a/ words have four letters? 4. What are the two /i/ words on the list? Two clowns like to play tricks on each other. One clown has changed the letters around in some of the words. 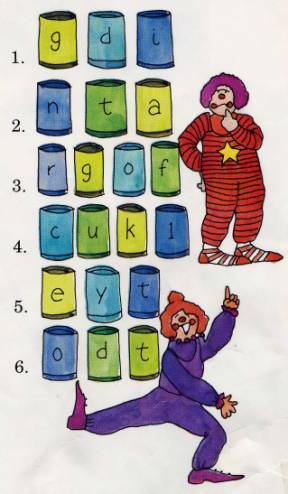 Can you help the other clown put the words back the way they were? 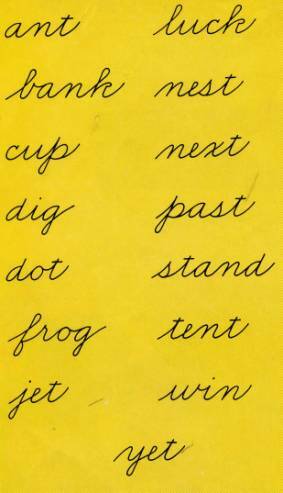 Can you find lesson words that are opposites for these words? Myra the Rhymer likes to find words that rhyme. But she has not done that very much lately. Can you help her? See if you can find words in the list that rhyme with these. Myra thinks she remembers how, to do her rhyming better now. She is ready to try some poems. Can you help her finish these? Have you ever played the Name Game? Find a word from the list to name each picture. G. Here is a story with some words missing. Can you finish it? One day a f___ stopped n___ to a building. "Why do you s___ there? Do you think it will bring you good 1___?" asked a passing cow. "No, but it will bring me water. Water comes p___ a bank. And this is a bank." The cow laughed. "You're looking for a river b___, not a building b___. How silly of you!" "Not as silly as talking animals," said the f___.